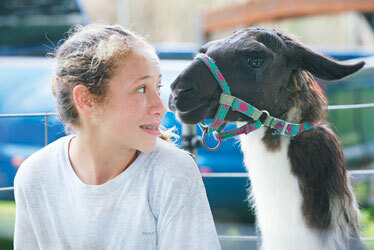 Melia White, 11, turned around after receiving a friendly nudge from a llama named Liberty at Nozawa's Ark petting zoo Saturday during the Waiahole Elementary School's 125th anniversary celebration. The event was sponsored by the Waiahole-Waikane Association, along with other school supporters, and featured a luau, live performances, pony rides, crafts, vendors and fun for the whole family. 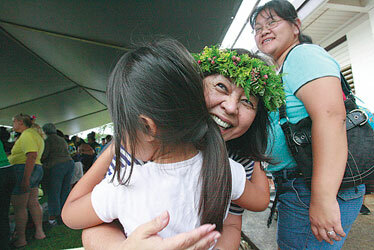 Frances Goya received a hug from Kylie Kwak, 5, as Kylie's mother, Robin, stood by during Waiahole Elementary School's 125th Anniversary Celebration. Goya attended the school from kindergarten through the ninth grade and graduated with the class of 1960. She volunteered with fellow alumni by serving food at the luau. Keiki from Ho'omaika'i Hula Halau huddled under an umbrella before their performance at Waiahole Elementary School's 125th Anniversary Reunion and Celebration on Saturday. 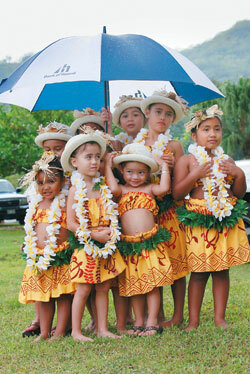 Under the umbrella were: (front row, from left) Hi'ilani Kay, 3; Linn Daskam, 5; Mia Antoque, 2; Hiilea Kay, 6; (back row, from left) Sadie Antoque, 6; Nalea Hukahiko, 7; Laynee Torres, 3; Shayla Tolentino, 7; and Shayla Young, 7.